Editor's Perspective ® Security 2.0 a Protecting data and applications is still important. But a new generation of IT and business innovations demands far more. Everyone knows IT security is dull. Firewalls, antivirus software, passwords and all the rest are certainly important. But then, so is brushing your teeth after every meal. It's time to look again. Security is undergoing a b CONTRIBUTING WRITERS major transformation, moving from prevention — important but dull — to enablement — important and exciting. But enablement of what? That's where the excitement comes in. Extending enterprise appli- cations and data to mobile devices, for one, allowing staff to work from anywhere at anytime. Innovating with the cloud, for another, creating business services that would be simply impossible without cloud technology. And getting a bigger bang from social media such as Facebook, Twitter and YouTube. To put it bluntly, none of these innovative technologies is going anywhere without sufficient security. Consider, for example, Google Wallet and other new mobile phone payment systems. Great idea, right? But without effective secu- rity and authentication in place, these systems would be simply unworkable. You need to know that the users are who they say they are, that the credit card they're using is really theirs, that the purchase is within the credit level — and you need to shield the entire transaction from the bad guys. Security today is no longer an afterthought, no longer something you tack on at the end. 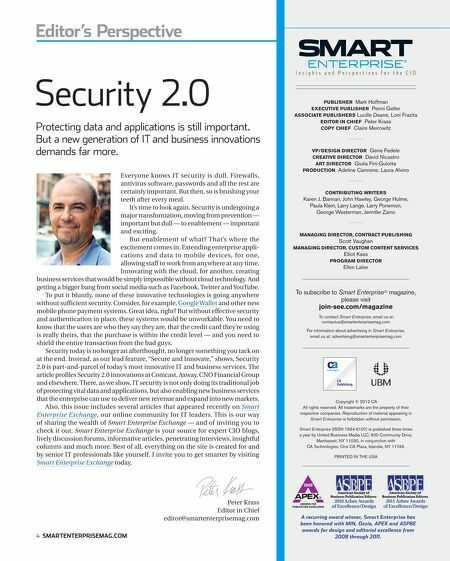 Instead, as our lead feature, "Secure and Innovate," shows, Security 2.0 is part-and-parcel of today's most innovative IT and business services. 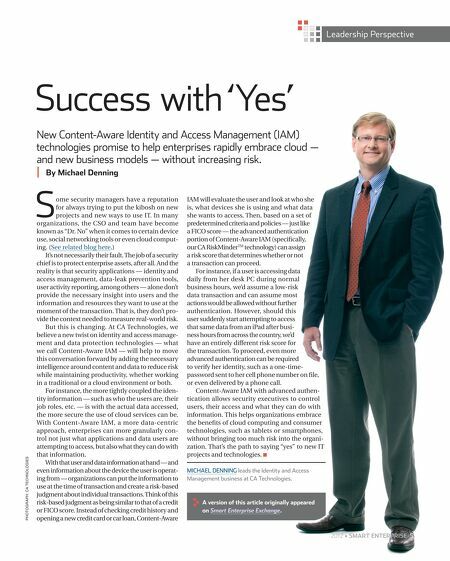 The article profiles Security 2.0 innovations at Comcast, Axway, CNO Financial Group and elsewhere. There, as we show, IT security is not only doing its traditional job of protecting vital data and applications, but also enabling new business services that the enterprise can use to deliver new revenue and expand into new markets. Also, this issue includes several articles that appeared recently on Smart Enterprise Exchange, our online community for IT leaders. This is our way of sharing the wealth of Smart Enterprise Exchange — and of inviting you to check it out. Smart Enterprise Exchange is your source for expert CIO blogs, lively discussion forums, informative articles, penetrating interviews, insightful columns and much more. Best of all, everything on the site is created for and by senior IT professionals like yourself. I invite you to get smarter by visiting Smart Enterprise Exchange today. Karen J. Bannan, John Hawley, George Hulme, Paula Klein, Larry Lange, Larry Ponemon, George Westerman, Jennifer Zaino MANAGING DIRECTOR, CONTRACT PUBLISHING Scott Vaughan MANAGING DIRECTOR, CUSTOM CONTENT SERVICES Elliot Kass PROGRAM DIRECTOR Ellen Lalier To subscribe to Smart Enterprise® please visit magazine, join-see.com/magazine To contact Smart Enterprise, email us at: contactus@smartenterprisemag.com For information about advertising in Smart Enterprise, email us at: advertising@smartenterprisemag.com Insights and P er spectiv es f or the CIO PUBLISHER Mark Hoffman EXECUTIVE PUBLISHER Penni Geller ASSOCIATE PUBLISHERS Lucille Deane, Loni Frazita EDITOR IN CHIEF Peter Krass COPY CHIEF Claire Meirowitz VP/DESIGN DIRECTOR Gene Fedele CREATIVE DIRECTOR David Nicastro ART DIRECTOR Giulia Fini-Gulotta PRODUCTION Adeline Cannone, Laura Alvino Copyright © 2012 CA All rights reserved. All trademarks are the property of their respective companies. Reproduction of material appearing in Smart Enterprise is forbidden without permission. Smart Enterprise (ISSN 1934-6107) is published three times a year by United Business Media LLC, 600 Community Drive, Manhasset, NY 11030, in conjunction with CA Technologies, One CA Plaza, Islandia, NY 11749. PRINTED IN THE USA Peter Krass Editor in Chief editor@smartenterprisemag.com 4 SMARTENTERPRISEMAG.COM 2010 Azbee Awards of Excellence/Design 2011 Azbee Awards of Excellence/Design A recurring award winner, Smart Enterprise has been honored with MIN, Ozzie, APEX and ASPBE awards for design and editorial excellence from 2008 through 2011.